Desiderius Erasmus (October 27, 1469 – July 12, 1536) was, by his own account, born in Rotterdam, Holland. His father was a priest and his mother the daughter of a physician, who, unsurprisingly, were not married. As a child of an illicit union, he had no apparent prospects for a successful worldly career, so he was initially educated for the life of a cleric. However, he was very unhappy during these early years of his education and training, feeling that the strict, narrowly constrained life didn’t suit him. Though he was ordained a priest, Erasmus later insisted he was pressured into doing so, likely because by that time he had long been an orphan of no means to speak of and so had no apparent alternative means of support. Erasmus was, however, a very pious man, but in his own way. The Catholic Church, at this time, was seen by Erasmus and others of like mind as a decadent, corrupt, licentious institution in deep need of reform, as it had largely cast aside the pure, simple Christianity of its humble founder. Nevertheless, Erasmus’ reformist instincts did not ally him with those who wished to do away with the Catholic Church altogether: like his friend and protégé Thomas More, he saw the Church as a unified spiritual body that must be preserved. While he was sympathetic to Martin Luther’s impassioned and wholehearted rejection of ecclesiastical corruption, Erasmus rejected his views on the hopelessly sinful nature of humanity, so corrupt that goodness and redemption were dependent entirely on God’s grace. Erasmus contended that human beings had God-given free will, and thus were capable of goodness by exercising that will to choose good and reject evil. Erasmus also rejected Luther’s radical and wholesale rejection of the Church. 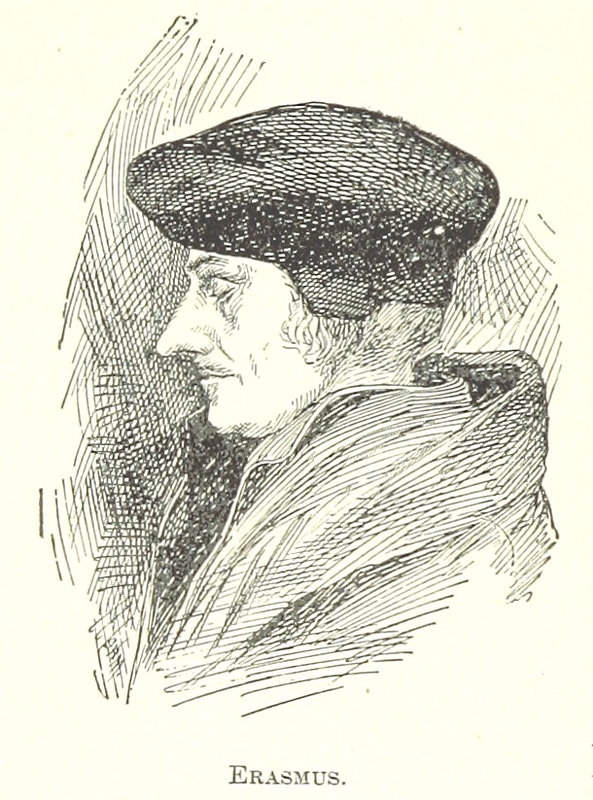 Erasmus believed, rather, that reform would be achieved within its institutions by its conscientious members and through individual inner spiritual renewal, characterized by a life of love and humility in conjunction with a simple piety unconcerned with convoluted doctrines and earthly show. The Church, Erasmus believed, would also hugely benefit from a greater focus on secular and classical learning. After all, the human mind was one of God’s greatest creations, so the products of human intelligence deserved attention and reverence second only to sacred writ. Besides, secular scholarship could act as a valuable corrective to theologians’ tendencies to get so wrapped up in fine points of doctrine that their convoluted wranglings served only to confuse and confound the faithful. These convictions, and his long and successful career as a scholar and writer inspired by them, made Erasmus the godfather and patron saint, so to speak, of humanism. Erasmus did not invent that school of thought, but he created so many seminal works in that genre that his name has come to be nearly synonymous with humanism. A brilliant and deeply read scholar, Erasmus’ incredible body of work included annotated translations of classical Greek and Roman works; theological treatises; collections of proverbs and adages; works on aesthetics, style, and writing; voluminous correspondence with the most learned scholars of his time; and much, much more. 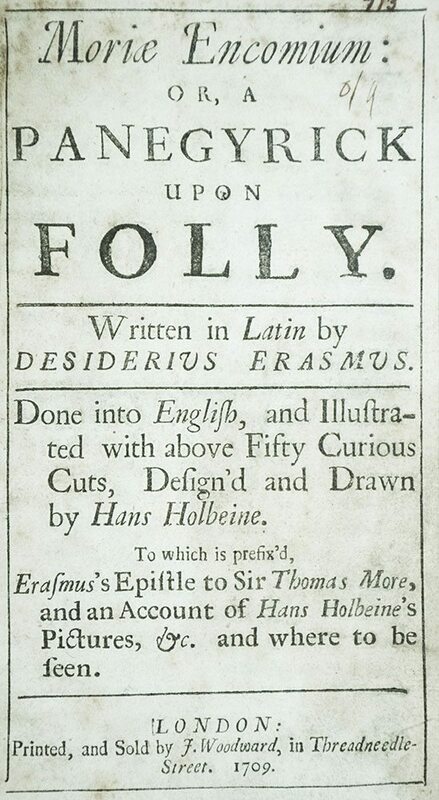 Erasmus’ most widely known and popular work, however, remains his In Praise of Folly. However brilliant Erasmus was otherwise, he was unsurpassed as a satirist, and he used his cutting wit as a reformist tool, arguably more effective and memorable than his erudition and most eloquent argument. Despite Erasmus’ disadvantageous start in life in other ways, he made the most of the education he was fortunate to receive. Over the course of his long life, his dissatisfaction with monastic and court life and restless curiosity drove him to create a career as a man of letters on his own terms, seeking patrons that allowed him a career of as much intellectual freedom as the times would allow. Erasmus is often a slippery character, and his motivations and true convictions are hard to pin down, by design. He was least as pragmatic as he was idealistic, and however sharp and potentially dangerous his religious and political satire, he deftly avoided getting himself in trouble in the turbulent and dangerous era he lived in. Not so Erasmus’ friend and protégé More, whose similarly sharp wit and lawyerly skill did not sufficiently counteract his religiosity enough to avoid the chopping block. This entry was posted in Happy Birthday!, History of Ideas, Religion, Written by Amy Cools and tagged Catholicism, Classicism, Classics, Desiderius Erasmus, Diarmaid MacCulloch, Eamon Duffy, Erasmus, Eric MacPhail, Erika Rummel, Free Will, Humanism, Humanist, In Praise of Folly, James D. Tracy, Jill Kraye, Martin Luther, Melvin Bragg, Protestant Reformation, Reformation500, Satire, Thomas More. Bookmark the permalink. 1. I’d been afraid that the lapse indicated that no one was ever going to have a birthday. Thanks goodness that is not the case. 2. I’d always known that Erasmus was someone special but I’d never previously/really known how very special. To wit:: “He was the son of a priest and the daughter of a physician, who, of course, were not married.” But I guess it’s not so surprising – after all, very few famous male [“he”] scholars who were daughters of physicians get married, especially if they also were sons of priests. Thank you very much for the good laugh and for catching my mistake, I meant to write that his mother was the daughter of a physician! It might seem a bit weird, I realize, to wish long departed people happy birthday, but I hope my readers enjoy this perhaps whimsical way of paying tribute to their memories and honoring their legacies.